I think I have all the bare materials I need for this. So it’s cutting, wiring, powering from here. 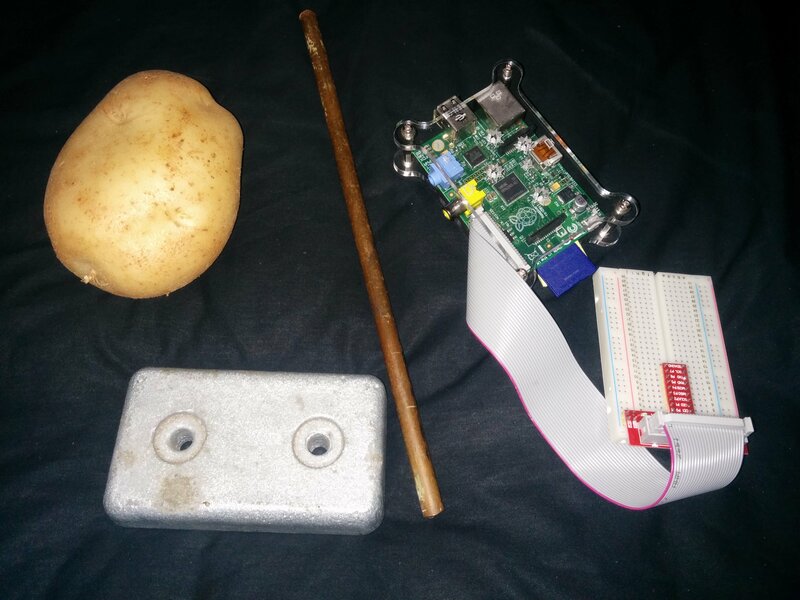 All this together?…potato powered Pi. Very interesting article in the Heraldsun. I really need a supplier for nfc micro sd cards, desperate. Alibaba is a waste of time. I see fantastic potential for NFC – automate home with no hard wiring, etc. Thanks for a moment of your precious time. ebay has been pretty good for me. Android made a bunch of stickers which incorporated NFC and had a cool logo. Really depends on what you’re trying to do. Personally, I’m wiring up NFC on my front door, my coffee table has an NFC sticker that contains my wireless network settings so my guests can connect without complication. There’s so much more you can do. A mate of mine joked about using it to start his car. So imagination is key. RF and NFC is still kind of a cowboy field at the moment, so standardisation is a little dodgy. Just re-read your message. What do you mean by NFC for micro SD cards? I have been working on some tech that uses NFC as the communication protocol, but ultimately connects to the chip from a micro SD. Although I’ve not publicised the work yet. The only benefit I could see from what I was building was something that approximates a mnemonic courier as portrayed in the movie “Johnny Mnemonic”. It was a fun idea, but aside from completing the design I haven’t really built it yet. The chip in my hand stores a very small amount of data which I can change very easily. But it is small. Which is why I was looking at something a little more serious. Anyway, you can get NFC in practically any shape. There’s only 2 frequencies it works with in general. 13.57mhz I and 127khz off the top of my head. On top of that, there’s actual communication protocols too. For bulk supply, you might want to look at companies that produce barcoding or security for shops. There was a place called Existco back when I was living in Perth who made chips like mine (although they were not safe for human implant). Otherwise, I’ve relied on ebay and dangerousthings.com so far. The simplest things; an inductance coil linked to a microchip! I think I understand because yours is a tag, ergo programmable from an NFC source. Basically I just want to NFC enable pre NFC phones and to test the writing abilities of the apps. Very similar to old world macros. The possibilities are endless. But I need links to buy a few just to test. I have 4 MS &Cisco certifications back in 2k, in India; but got canned for jobs back in OZ. I would like to link up with you sometime, as I am 24/7 for my wife as her carer. I’m up in the Dandenongs. I believe there are markets for home security, automation etc, not yet explored. And I agree that this is still a cowboy domain. Mykl would be a good starting point but would require much homework to get entrance. I found that S.A was the best starting point for new marketing concepts. I know moneto and others (MasterCard,) have optioned, but I sense many possibilities in home and security applications. I am always exited by creative potential.